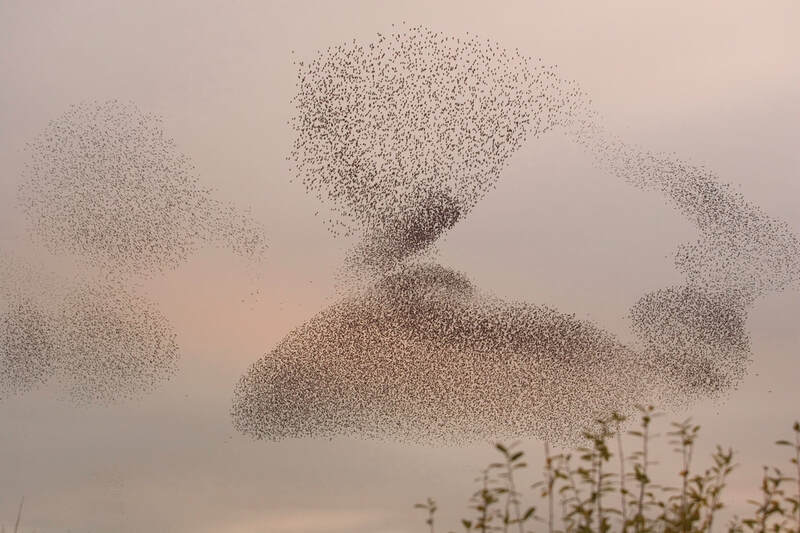 One of the wildlife highlights of winter in the UK is the spectacle of starling murmurations. These familiar garden birds amass at dusk before spending the night in reedbeds, or on structures like bridges and piers. ​Gathering in large numbers has three main benefits for the birds: many eyes to watch for predators, and warmth on a chilly evening, for example. Also, if you’re a younger bird or new to the area (many will have come from eastern Europe) you can follow more experienced starlings to find the best places to eat in the morning. Just before settling down they whirl in the skies above forming dramatic shapes, a mesmerising display which helps them dodge avian hunters like peregrines and sparrowhawks. In early winter, tens of thousands of starlings arrive on this reserve – where as an added bonus you also get fantastic views of St Michaels Mount. Arrive earlier in the day to see massive flocks of barnacle geese from Svalbard, then stick around to enjoy up to 60,000 starlings filling the skies. Last winter this coastal nature reserve had flocks of over 40,000 starlings: they’re best seen from the North Wall, ten minutes’ walk from the visitor centre. Around 50,000 starlings spend the night among the reeds here. Their numbers tend to peak in November, and last winter the birds remained until January. Murmurations of around 20,000 birds are best seen between October and December, and the reserve team runs special walks in November when the starlings are most predictable. Between 1995 and 2016 the starling population here in the UK dropped by 51%. In England numbers declined by 87% between 1967 and 2015! The causes are, so far, unclear, but it seems that the problem is occurring after the birds have raised their young and left the nesting area. In 2018 RSPB scientists, funded by Natural England’s Action for Birds in England (AfBiE) programme, ran a pilot project following radio tagged starlings in Bristol. The team hope that by finding out where the birds go, they will be able identify what’s driving the loss of starlings in the UK.